After leaving the refugee detention centre in Essex, Little Bee sets out to find two people she met for only one moment on a beach in Nigeria. That one moment changed the lives of three people in terrible ways. Sarah and Andrew have tried to put the event that brought Little Bee into their lives behind them but she has haunted them for 2 years. When Little Bee calls and says, "I am coming," will they be able to face her? 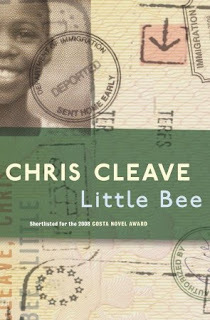 Little Bee by Chris Cleave alternates between the points of view of Little Bee, a 16 year old Nigerian refugee, and Sarah, an English magazine editor and mother to a Batman obsessed 4 year old. It's an engrossing story of survival and loss, guilt and reconciliation. I didn't want to put it down. Somehow Little Bee comes off as both vulnerable and strong. She's quick to react to any situation, nothing seems to faze her, but inside she is broken. She believes she knows how the English think though she's had little contact with them. All she has learned of them she's learned through the newspaper. She's full of confidence but she does make mistakes (sometimes with funny results). Sarah is all strength on the outside. Inside she's full of doubts. Her missing finger and her husband's depression are physical reminders of all she wishes she could forget. When Little Bee arrives, her life will change in ways I can't tell you about until you read it. The writing is lovely, especially Little Bee's chapters, but there is a horrific scene that I still think about, though it is the scene on which the story pivots. Though it's a character driven plot, the pacing is quick. The women are fully fleshed but I do think that the male characters were weak and I couldn't warm up to them. I was blubbering by the time I got to the ending, not just because it was sad, but because it was also a beautiful scene. Thanks to Random House for this copy. I love a good book that can make me blubber. :) I'll have to keep my eye out for this one in the bookstores. Oooh, this one looks good! Thanks for the great review, It's going on my TBR list! That sounds like my kind of book. Great review. i'm always amazed by books that can make me cry. i'm generally pretty stoic, so i know writing or plot has to be pretty powerful to bring tears to my eyes. my tbr pile gets longer and longer each day. reading book blogs--hazardous to my TBR pile. Ah, I have a copy of this, why haven't I read it yet??? I have this book here to read. Sometime I will get around to it! Books that can make me cry are always precious keepers. Jen & Kailana- I look forward to your thoughts. Alce & Shannon- I hope you get a copy! Desert Rose- Thanks for the award. Booklineandsinker & Julia- It doesn't happen that often so it must be good. I've been really intrigued by the jacket blurb of this book, so I really appreciate your review - just enough info but not too much. One of these days I'm going to read this. It sounds worthwhile.